Create a handy landing pad for the next wet mess in your kitchen or bathroom before it ever happens! These highly absorbent microfiber-and-foam mats are perfect near sinks and faucets, where drippy, sticky, gooey messes are most likely to occur. A layer of soft Norwex Microfiber tops a thin layer of foam to absorb drips and spills from wet glasses, bottles and jars. The textured bottom layer features silicone dots to reduce slippage. 25.4 cm x 20.3 cm / 10" x 8"
20.3 cm x 15.2 cm / 8" x 6"
Microfiber-and-foam mats quickly absorb drips and spills to help keep surfaces clean. 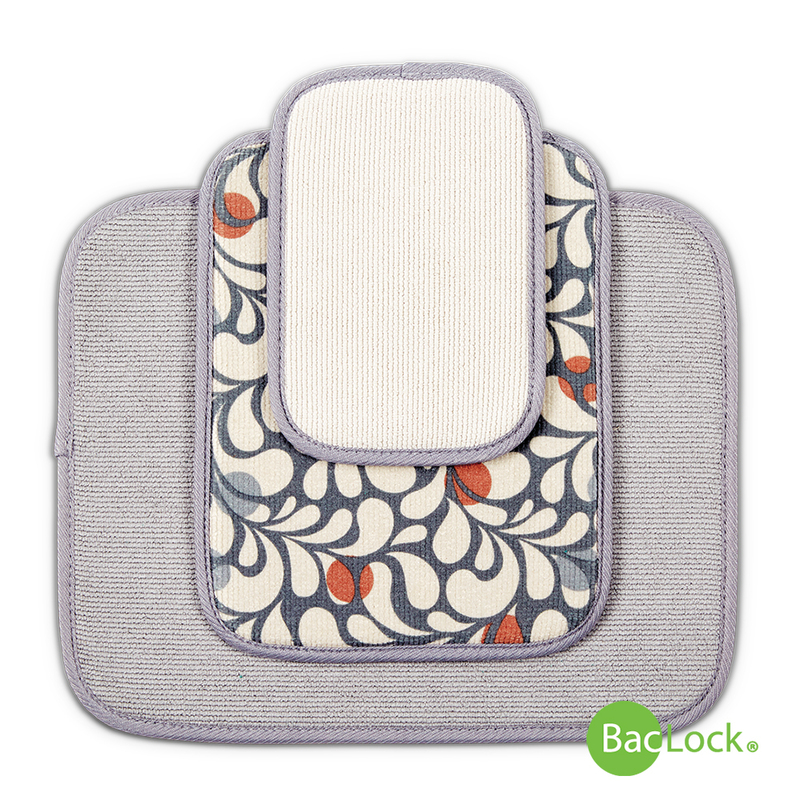 Unique textured backing helps prevent slipping. 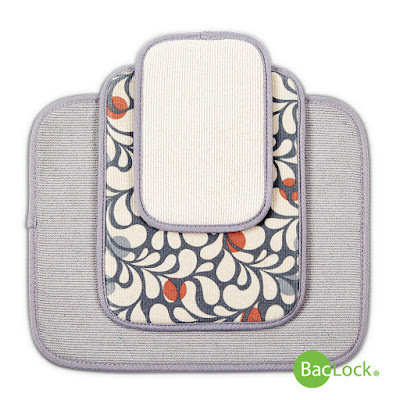 The BacLock®* in the cloth—our micro silver antibacterial agent—goes to work to self-purify and inhibit odors from bacteria, mold and mildew growth within the cloth within 24 hours so that it is ready to use again. Neutral graphite and taupe color combination complements any décor. 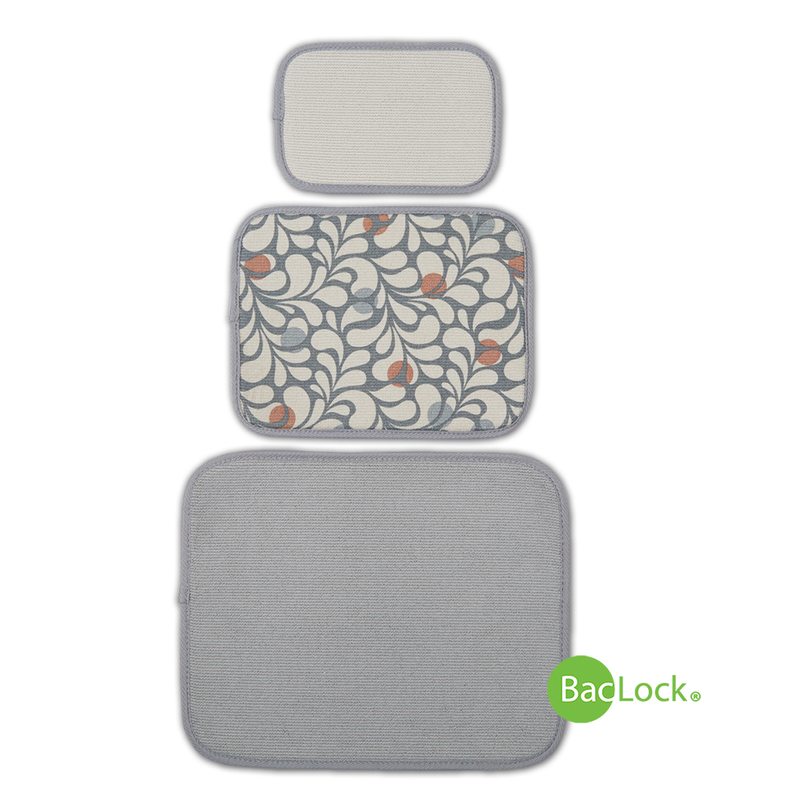 Set includes a small, medium and large mat, so there’s a size for every space. Place near any sink or faucet to provide a convenient resting place for wet or messy glasses, cups, bottles, toothbrushes, bathtub toys, pet products and soap dispensers. *Contains BacLock®, an antibacterial agent for self-cleansing purposes only. The agent is solely designed to inhibit odor from bacteria, mold and/ or mildew growth within the product. Join for FREE and Fall for Norwex!